STA is already figuring out ways to modify their bus routes when this section of Monroe goes from five to three lanes. The proposal to reduce about a mile-long section of Monroe Street from five lanes to three has been controversial for quite a while, but lately, as the businesses along the stretch have launched a protest effort, that controversy has become more visible. But others concerns, like the worries from Monroe Street businesses fretting that they won't be able to survive the construction season, are reasonable ones. And while research suggests that reducing lanes doesn't necessarily increase congestion if you're smart about where you build, several business owners have raised concerns about what happens when STA buses stop to pick people up during rush hour. It's a good question. Monroe is STA's third busiest route, with nearly 650 bus trips taken on the route every week. So we called up Spokane Transit Authority to figure out how they'll be able to manage. First, as has been reported, STA plans to reduce the number of bus stops on that mile long stretch. "In that affected construction area, we’ve already planned to reduce it from [four] stops to [three] stops," says STA Spokesman Brandon Rapez-Betty. "As with all of our high-performance transit infrastructure, the goal is to help transit move quickly," Rapez-Betty says. However, STA doesn't actually currently have the funding to build that sort of infrastructure along Monroe. The recent tax hike would pay for operation costs, but not construction costs. 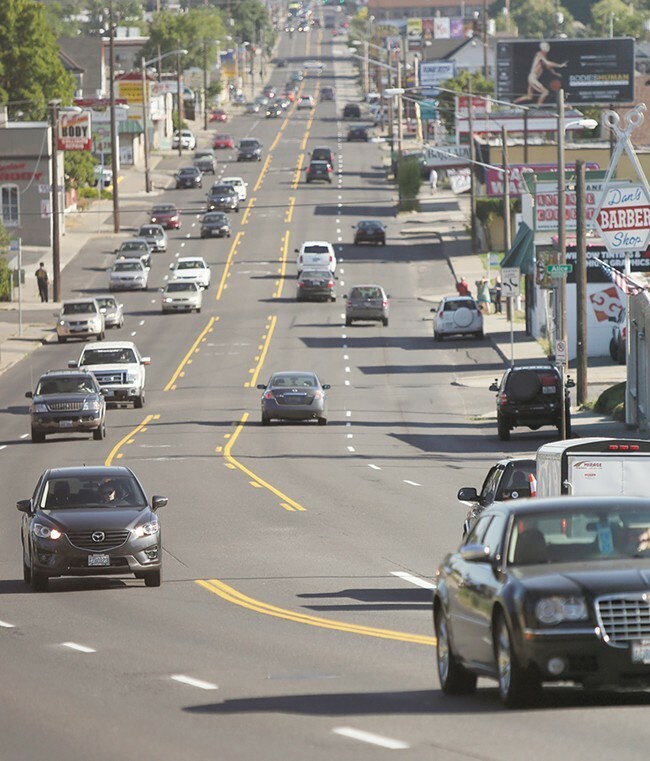 STA is hoping for a state grant that will allow it to build high-performance transit along Monroe from 57th street on the South Hill all the way up to the Five Mile area. But for the purposes of explanation, let's say that STA does none of that. Let's say they don't build any high-performance transit systems on the section of Monroe and keep the same number of stops. The lane reductions, Rapez Betty says, would add an average of 25 seconds to a commute during the busiest time of the day, going northbound, in the busiest direction. That's not nothing. But it's not a massive traffic jam, either. STA promises to continue to work heavily with the neighbors and the city to continue to adapt to the new plan. "We're watching every move that the city is making, making sure we are going to be in lockstep," Rapez-Betty says. Is there anything Spokane can do to stop stupid trucks from crashing stupidly into bridges? Can anything be done to fix the awful merge onto the Maple Street Bridge?